Please join us in welcoming Lynette Vanderwarker to our KFN Advisory Board. Lynette is the Chief Strategy Officer and Managing Director at Angel Island Capital. Lynette Vanderwarker is Chief Strategy Officer and a Managing Director at Angel Island Capital, which she joined in 2018. Previously, Lynette spent five years with KKR, where she led the Credit Strategies Group as a Managing Director. 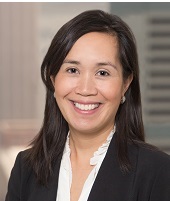 Prior to KKR, Lynette spent ten years at BlackRock, where she was involved in a broad range of activities, including co-leading the Fixed Income Strategy group, as well as structuring and marketing the firm’s hedge fund strategies. Earlier in her career, she worked at Goldman Sachs Asset Management as a Vice President in the Global Manager Strategies group. Lynette currently serves on the Board of Directors of the Aperio Group, a research-based investment management firm. Philanthropically, she serves as a member of the Board of Trustees of the Brownstone School in New York as well as the Development Committee for the Women’s Sports Foundation. Lynette has a BA from Northwestern University ('96) and an MA in Public Administration from Columbia University ('99).